Have you recently started learning Spanish and already feel stuck? Our team at Visual Link Spanish has compiled these tips to help you learn Spanish easier. Keep these in mind and let us know if you have any questions. Read out loud ALL THE TIME. Reading out loud gives you all of the benefits of reading, plus you’ll get really good pronunciation practice. In fact, as a beginner, you should read aloud as much as possible. You may not feel it right away, but all those hours of reading out loud to yourself will help you speak Spanish more fluently. Find a partner. There are hundreds of communities connecting native speakers with each other! Browse the Internet and try to find a native speaker who can be your conversation partner and language tutor. And you can be the same for them, helping this person learn your native language (and it doesn’t have to be English). Patience is key. When learning a foreign language, do not expect to be making the same steady progress day after day – or week after week. In fact, progress in learning a foreign language rarely follows a straight line. You will experience struggle, setbacks and frustration because of the lack of progress – and that’s absolutely normal. Hitting plateaus is normal, so don’t let this experience discourage you. Just keep learning and never give up. Post-it is your friend. Expanding your Spanish vocabulary is easy: all you need is a dictionary and a pack of post-it or anything to make labels. Simply label all things around your house. For example: la pared (wall), la puerta (door), el escritorio (desk) etc. Don’t remove the labels until you have mastered the vocabulary to perfection, including spelling. Get used to flashcards – again. Haven’t used flashcards for years? It’s time to bring them back! This old school strategy still works. Make cards that are small enough to easily carry with you, and write the English on one side and Spanish on the other. Be sure to ALWAYS have some cards with you. This way, you study anytime, anywhere, be it during your daily commute or while waiting in line at a grocery store. Talk to yourself -no, this isn’t crazy and there is science behind this approach. When learning a foreign language, most people tend to develop their listening skills more rapidly than their speaking skills. This is why so many language learners may be able to understand a foreign language a lot better than actually speak it. To counter this problem, you can speak to yourself in Spanish as much as possible. Since you will be alone with no one else around, you won’t feel shy to try and speak your heart out in Spanish. Consistency matters. If you are serious about learning Spanish, you should be consistent in your efforts and consistently set aside the time you will spend learning. More often than not, it’s not about the amount of time you spend but about consistency. Spending 15-20 minutes learning Spanish every day is better than doing a few hours sporadically. Practice makes perfect. To learn to speak the language, you need to SPEAK. There are no grammar classes to substitute the importance of actually going out there and speaking. Practice with native speakers and other language learners, and you will be amazed how these conversations will improve your progress. Listen… and listen. There is such a thing as an “ear” for Spanish – or any other foreign language for that matter. The more you listen to the language and try to participate in conversations, the easier it gets to understand them. An easy was to develop a “good ear” for Spanish is by listening to Spanish music, watching Spanish movies, or watching Spanish TV. Remember: you won’t be perfect, and that’s okay. Don’t expect to be perfect! Learning takes time, so when learning a new language, expect that you will make mistakes, and don’t be embarrassed by them! Are you looking for reliable Spanish Learning Materials? Check out our FREE Spanish learning course! If you have been studying Spanish for some time, you most probably know that there are two words to say You in Spanish. This is common for Roman languages, and the rules of French and Italian, for example, are the same – just so you know. Now, back to Spanish :). So, there are Tu and Usted. Tu is an informal and friendly pronoun, used when talking to a person you call by their first name. The word Usted used in cases of formal speech, or when you do not know a person well. Addressing anyone with a title in their name, you should use Usted. As typhoon Haiyan, or Yolanda, as it’s called in the Philippines, has swept through this Asia-Pacific island country, it caused massive destruction with as many as 10000 feared dead. With the prayers and relief coming to the Philippines from all over the world, we thought it would be a good idea to mention something not so many know about. As Spanish speakers and language learners, we usually keep the list of Spanish speaking countries in mind. Yet, not all of us know that until relatively recently, Philippines used to be a Spanish speaking country, too. Philipino, or Tagalog, one of the two official languages (the second official language is English now), bears a lot of similarities with the Spanish pronunciation and vocabulary. Spanish was introduced in the Philippines after 1565, when the Spanish Conquistador Miguel López de Legazpi sailed there from Mexico and founded the first Spanish settlement on Cebú. As the colonial rule was established, the first printing press founded and the first books released were in Spanish. 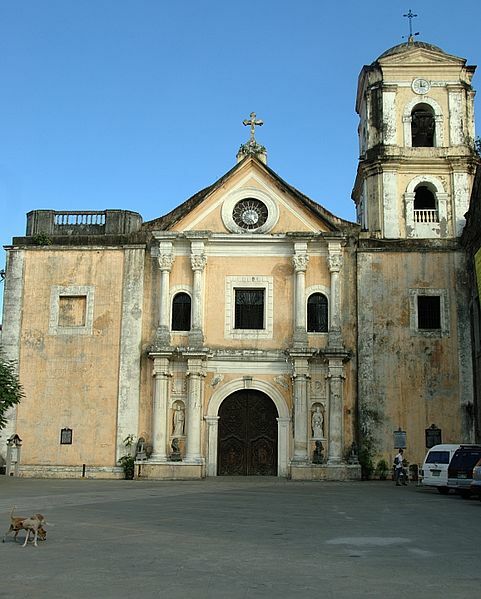 In the 17th century, Spanish religious orders founded the first universities in the Philippines, some of which are considered the oldest in Asia (University of Santo Tomás in Manila and the University of San Carlos in Cebú). During colonial rule through Mexico City, Spanish was the language of education, trade, politics and religion, and by the 19th century, it became the country’s primary language, although it was mainly used by the educated Filipinos. In the 19th century, a Spanish decree introduced a system of public education, creating free public schooling in Spanish. Shortly, this island nation, the Philippines had a prominent group of Spanish-speaking scholars and thought leaders, many of whom participated in the Philippine Revolution and later in the struggle against American occupation. In 1899, the First Philippine Republic established Spanish as the country’s official language, with both the constitution and the anthem written in Spanish. However, the independent republic itself didn’t last long. As a result of the Spanish-American war, Spain ceded the islands to the United States. Under U.S. rule, the English language began to be promoted instead of Spanish, and the use of Spanish promptly declined. The 1950 census stated that Filipinos who spoke Spanish as a first or second language made up only 6% of the population. And another 40 years later, in 1990, the census reported that the number had dwindled to just 2,500. Spanish lost its official status in 1987, and was dropped as a college requirement, remaining an optional course. Today, it is a required subject in only some academic institutions, such as the University of Santo Tomás in Manila and the University of San Carlos in Cebú. Former president Gloria Macapagal Arroyo, a third-language Spanish speaker, introduced legislation to re-establish the instruction of Spanish in 2009. Today, the language is still spoken by Filipino-Spanish families, mainly concentrated in Metro Manila, Iloílo and Cebú. Yet, despite government promotions of Spanish, less than 0.5% of the population are able to speak Spanish at least proficiently. While the Spanish language has never been 100% accepted by the Philippines population, it is still reflected in the country’s culture and art, and has contributed a number of words and expressions in Tagalog, Cebuano, and other Philippine languages. Here’s to hopes and prayers for this island nation recovering from the terrible tragedy. What were the highlights and low-lights of this past year? What did I forget to do? Did I accomplish my goals? Personally, I hope to learn from 2011 and apply what I learned in 2012. I know that many of you reading this blog post have a goal to learn Spanish. That is a good goal; however, perhaps you should be a bit more specific. Instead of merely saying that you want to learn Spanish, I recommend that you set a goal to become fluent in basic conversational Spanish. This will help you to focus on the goal at hand. 1. I wrote my goals down, then I forgot them. 2. I set too many goals, thus there was not enough focus on individual goals. 3. I wasn’t specific enough with my goals. 4. I didn’t celebrate the small successes. I will elaborate further in an upcoming video lesson and blog post, but that tells the tale for the most part. As you reflect on the past year, don’t allow yourself to be overcome by your mistakes. I am a firm believer in positive thinking when I remember to positively think. Yesterday I was at the gym working out with a friend. I was helping her do the bench press in order to build some upper body strength. She hadn’t done the bench press in a long time. As I pushed her and spotted her weights, she would be about to give up and I’d encourage her and help her do a few more reps. Mentally she would think she was done at 10 reps, but I’d encourage her and she would often do at least 5 more reps. I told her that she needs to give herself opportunities to surprise herself. I don’t have any kids, so I’m not going to give you any parenting advice. All that I can do is think of ways that I can be a good father when that opportunity arrives and also try to see things from a son’s perspective. I grew up in a large family. My parents were not perfect parents but they were great parents and did their best, and I love them for that. I knew they could see some sort of potential in me and they still do. There have been times when I have been very motivated to achieve my potential, and other times when there has not been much motivation at all. Yesterday I learned a great lesson: “Give yourself and others the opportunity to be surprised.” This has made me reflect on the past and think about the future. I took piano lessons for 6 years in my youth. I wasn’t a great piano student, but my mom made it a rule that we couldn’t play organized sports unless we took piano lessons. Sometimes I would enjoy the music I played and work hard to learn it. Other times I didn’t. Had I simply worked a little bit harder, I think I would have surprised myself and my parents. Instead, I just thought about playing sports and I did just enough to pass mom’s inspection. Many parents have had great success teaching their kids Spanish with the help of Visual Link Spanish software without knowing Spanish themselves. What a great surprise it must be to see your child speaking in a foreign language that you don’t know. On parenting forums I have read the thoughts of parents wondering if they should teach their child Spanish and what tools to use. They wonder what age is too young. One regret that I have from my youth is that many times I did just enough to get by so that I could play sports. I wish I had worked harder on the piano or taken on some other hobbies that didn’t involve basketball, football, baseball, and soccer. Don’t get me wrong, I love sports and I’m glad I play them, but it is good to be more well-rounded. Your kids need an opportunity to develop skills and talents. Give them an opportunity to learn Spanish. Give them an opportunity to work, play, and learn new things. Encourage hard work and creativity. Celebrate success. Let your kids surprise you and themselves. When is the last time you were surprised? I hope that it has been a great week for everyone. Last Friday I wrote a post about staying motivated on the weekends. I stated that it was difficult for me to stay productive on the weekend. I said that I would do better. Well, I did do better. I hope that you did too. I ate healthier than I normally do on weekends, maintained normal exercise routines, and was able to do some research on a few projects I’m working on. In no way do I write this to gloat; however, it was a victory for me because it’s something I’ve wanted to improve in my life. Now the trick is consistency. Certainly do give yourself a break on the weekend, but don’t lose complete sight of who you are, what goals you have, and what you want to accomplish in life. Many of you want to learn Spanish or improve your Spanish. Take a little bit of time this weekend to review or learn more with your Visual Link Spanish software and any other methods you have of learning. Let’s tackle this weekend. What do you want to accomplish this weekend?